Designed by Greg Thompson, Agenda offers a high-style alternative to the contemporary Swiss sans. Agenda is a fresh humanist sanserif inspired by Edward Johnston’s magnificent London Underground face, drawn in 1916. Italics in particular are vital styles of their own, forming interesting alternatives to customary sloped romans. Large and capable, the series offers fifty-two versions of the design. H. Berthold first published Akzidenz-Grotesk in 1896. The design originates from the type used in Germany by job-setters and trade printers of earlier centuries.This early sans serif preceded the first weight of Helvetica by over 40 years. 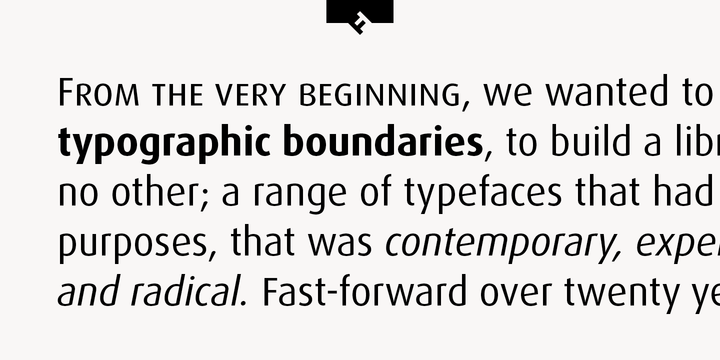 Throughout the years, H. Berthold has expanded this extremely popular and versatile family. AG Super was developed in 1968 by Günter Gerhard Lange and is an excellent choice for headlines requiring heavily-weighted strokes. Adrian Frutiger designed Avenir in 1988, after years of having an interest in sans serif typefaces. 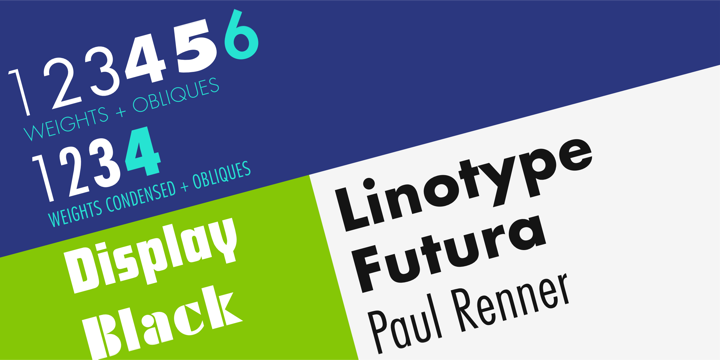 In an interview with Linotype, he said he felt an obligation to design a linear sans in the tradition of Erbar and Futura, but to also make use of the experience and stylistic developments of the twentieth century.The word Avenir means “future” in French and hints that the typeface owes some of its interpretation to Futura. 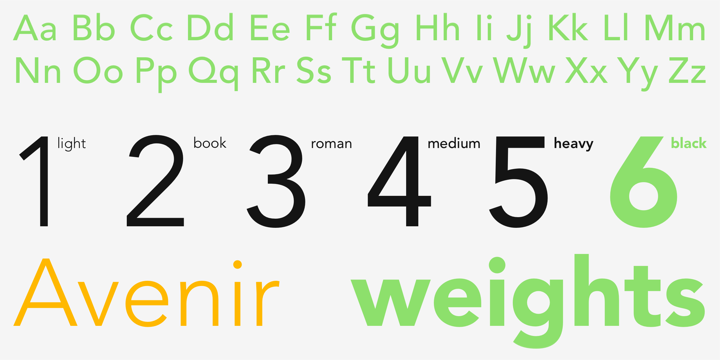 But unlike Futura , Avenir is not purely geometric; it has vertical strokes that are thicker than the horizontals, an “o” that is not a perfect circle, and shortened ascenders. 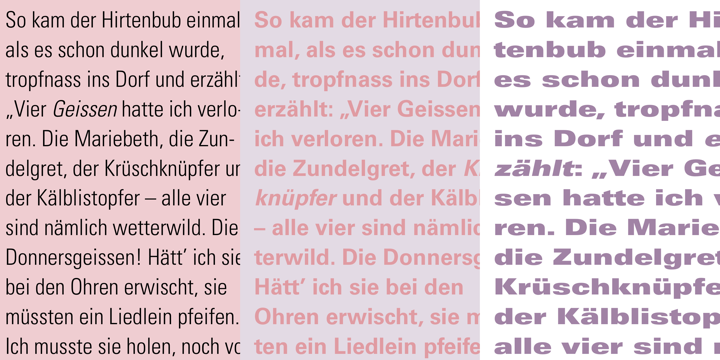 These nuances aid in legibility and give Avenir a harmonious and sensible appearance for both texts and headlines. Developed as a re-imagining of Morris Fuller Benton’s 1908 classic, the News Gothic™ typeface family, Benton Sans retains much of the workhorse flexibility of its predecessor, while introducing new features and refinements unavailable in the original design. With a wide range of weights and styles, Benton Sans has gained popularity in publishing and many other forms of print media. Benton Sans is recommended for Newspaper, Magazine, Book and Corporate use. 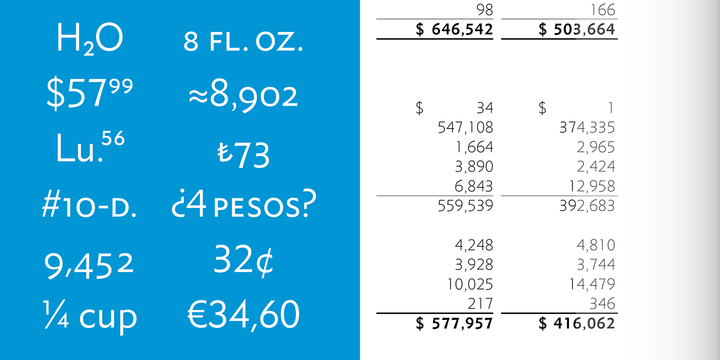 Corporate S is a clean and crisp sans serif design that’s very legible and readable. The name DIN refers to the Deutsches Institut für Normung (in English, the German Institute for Standardization). The typeface began life as the DIN Institute’s standard no. DIN 1451, published in 1931. It contained several models of standard alphabets for mechanically engraved lettering, hand-lettering, lettering stencils and printing types. These were to be used in the areas of signage, traffic signs, wayfinding, lettering on technical drawings and technical documentation. German type designer Hans Reichel created this sans FontFont between 1995 and 2000. 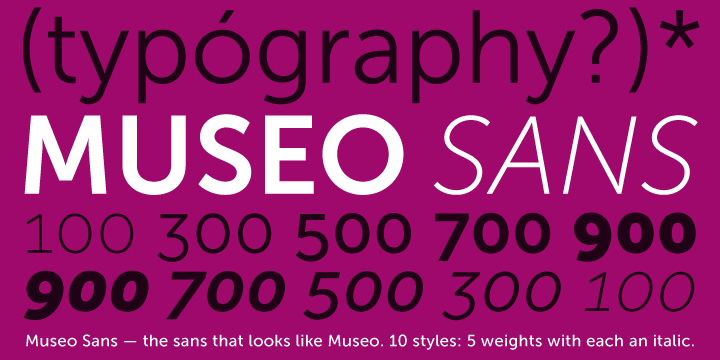 The family has 36 weights, ranging from Light to Black in Condensed, Normal, and Wide (including italics) and is ideally suited for advertising and packaging, book text, editorial and publishing, logo, branding and creative industries, poster and billboards, wayfinding and signage as well as web and screen design. FF Dax provides advanced typographical support with features such as ligatures, small capitals, alternate characters, case-sensitive forms, fractions, and super- and subscript characters. World renowned typeface designer, Adrian Frutiger, was commissioned by the Charles De Gaulle Airport near Paris in the late 1960s to develop a typeface for airport signage. Instead of adapting his previously designed Univers® family, he developed something new that would also go on to become a classic – the Frutiger® typeface. The new design was completed in 1975 and installed at the airport that same year. 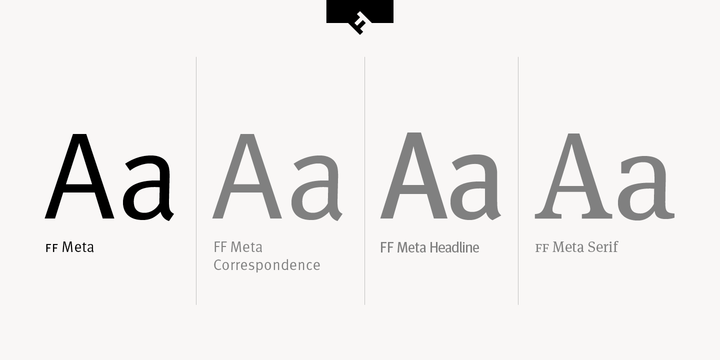 Futura – a popular typographic choice to express strength, elegance, and conceptual clarity. Paul Renner (type designer, painter, author and teacher) sketched the original drawings and based them loosely on the simple forms of circle, triangle and square. The design office at Bauer assisted him in turning these geometric forms into a sturdy, functioning type family, and over time, Renner made changes to make the Futura fonts even more legible. Helvetica – one of the most famous and popular in the world ! The Helvetica® typeface is one of the most famous and popular in the world. It’s been used for every typographic project imaginable, not just because it is on virtually every computer. Helvetica is ubiquitous because it works so well. The design embodies the concept that a typeface should absolutely support the reading process – that clear communication is the primary goal of typography. 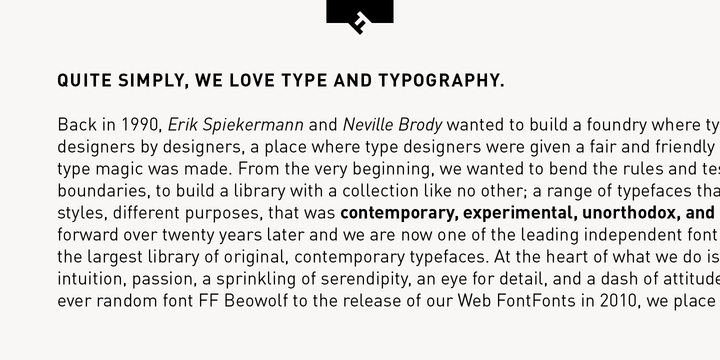 Neue Helvetica – quintessential sans serif font, timeless and neutral, and can be used for all types of communication ! Chinese fonts that pair well with Neue Helvetica: MHei HK (Traditional Chinese), MHei PRC (Simplified Chinese). The PMN Caecilia® design is a slab serif font with subtle changes in line thickness, large counters (the area enclosed completely or partially by a letter), and a taller than usual base height. 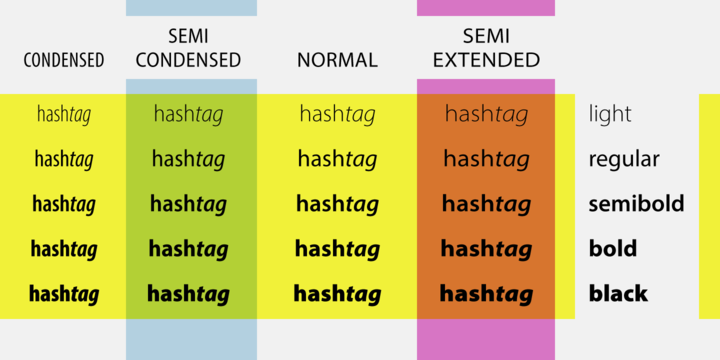 Because the lines of this font follow writing patterns rather than shapes, many people find this font easier to read. Interstate – recommended for Newspaper, Magazine, Book, and Corporate use. Interstate continues to enjoy wide popularity on everything from advertisements, website, publications, corporate branding, television programming, product design, book covers, and more. The FF Meta® design is a sans serif, humanist-style typeface that was designed by Erik Spiekermann for the West German Post Office (Deutsche Bundespost).In 2011, FF Meta was added to the MoMA Architecture and Design Collection in New York. This FontFont is a member of the FF Meta super family, which also includes FF Meta Correspondence, FF Meta Headline, and FF Meta Serif. FF Meta is suited for advertising and packaging, book text, editorial and publishing, logo, branding and creative industries, small text as well as web and screen design. 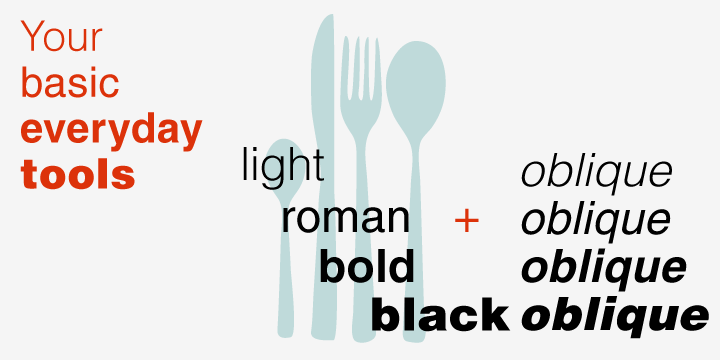 Metro Nova comprises seven weights, from ultra thin to extra black in regular proportions, and six weights as condensed designs. Each has an italic counterpart for a total of 26 fonts. The development of the Metro typeface began as a “design dare.” First released in 1930, Metro was the wildly popular result of a challenge to create a new, versatile and distinctive sans serif typeface for Linotype typesetters. Over 80 years later, Toshi Omagari welcomed the opportunity to update this seminal design for digital imaging. 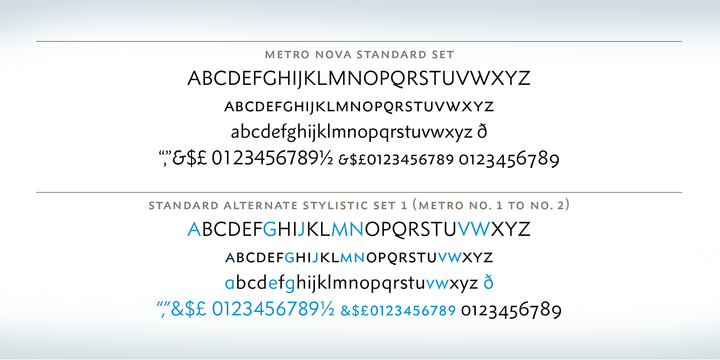 The new typeface, Metro Nova, builds on the foundation of the original Metro, preparing it perfectly for today’s taste and technology. 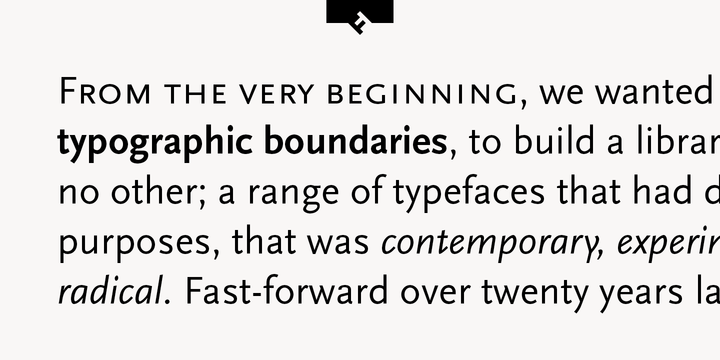 Myriad – an excellent choice for text typography that is comfortable to read. Designed by Robert Slimbach & Carol Twombly with Fred Brady & Christopher Slye, Myriad has a warmth and readability that result from the humanistic treatment of letter proportions and design detail. Myriad Pro’s clean open shapes, precise letter fit, and extensive kerning pairs make this unified family of roman and italic an excellent choice for text typography that is comfortable to read. This graceful sans serif humanist font may have a recent design history, but its roots go all the way back to the late 1700s. The FF Scala Sans’ font is a companion font to the FF Scala’ font, both created by Dutch designer Martin Majoor in the early 1990s. They were designed for the Vredenberg Music Center, a concert hall in Utecht in the designer’s native Netherlands. Slab serif typefaces are enjoying something of a renaissance, offering versatility whether for corporate identity, product branding, text or display use. With 40 weights to choose from Soho gives designers endless possibilities from the ultra chic lines conveyed by the lighter weights to the rock solid statement made by the heavier weights. 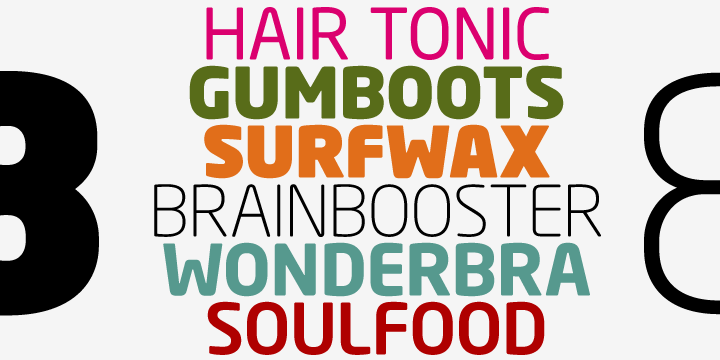 The Univers® typeface family is one of the most prolific grotesque sans-serif typefaces of the century. 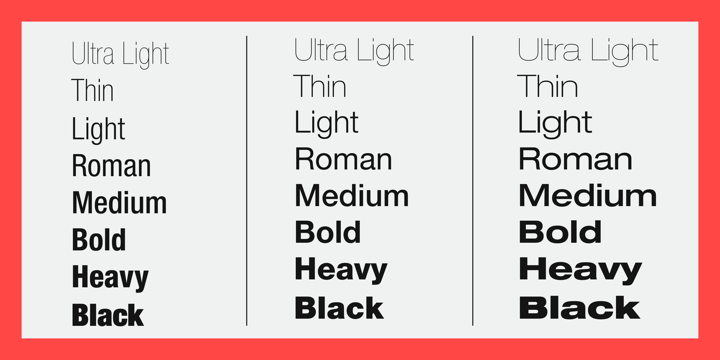 Like Helvetica®, Univers is based on 1898‘s Akzidenz-Grotesk. However, Univers is unique in that the design lacks superfluous features of any type, creating a design that is versatile and distinctive without being obstrusive. Adrian Frutiger began work on Univers in 1954, completing his design in 1957. The Univers type family has grown to 44 different weights and styles, some of which include Cyrillic characters. 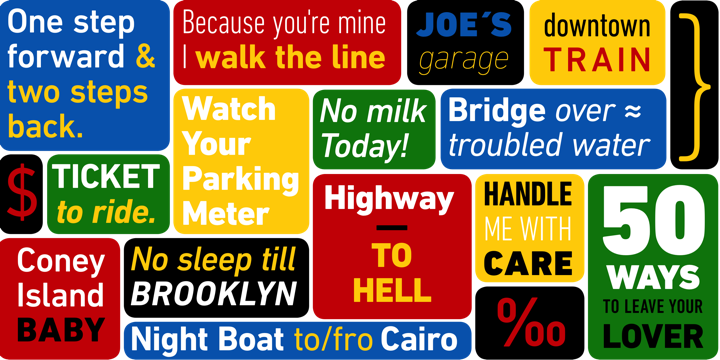 *this font compilation is based on bestselling font reference from Linotype, Monotype, myfonts and FontShop. This entry was posted in BestSelling Fonts and tagged Agenda, Akzidenz Grotesk, alt.TYPE, alttype, Avenir, Benton Sans, Berthold, Best Sellers, Best Selling, Best Selling fonts, Bestselling, Din Next, FF Dax, FF Din, FF Meta, Font Bureau, Fontfont, fonts for corporate branding, Fonts for logo, fonts for packaging, fonts for text, Fonts from Monotype, Frutiger, Futura, Helvetica, Interstate, Linotype, Lucas Fonts, Lucas The Sans, Metro Nova, Museo Sans, Myfonts, Myriad, Neo Sans, Neue Helvetica, PMN Caecilia, Scala Sans, soho, top favourite fonts, top popular fonts, Top selling, Univers on October 14, 2013 by alt.TYPE.